This lady has a serious cat obsession, right? The thing is she loves orange tabbies because they look so good with her pink bowls and shoes and that stunning polka-dot dress, but what she's obsessing about at this very moment is how disturbed she is by that green ball of yarn that is messing with her mind. Who the hell brought that in?? I haven't disappeared completely! My computer hasn't been behaving and I'm still trying to find my mojo. I'll be popping in to see you soon. I think I know this lady! Have a great weekend. I'm sure my mojo is on a long vacation and is debating whether to return or not.....damned moody thing it is! Maybe they are vacationing together? I have to go cut a pattern for some metal embroidery. Hopefully I don't cut *me*. Very nice. I like crazy cat ladies. Absolutely adorable drawing painting...and the green is a fun addition!!! Brightens the whole thing up so kudos to the kitty who got it out of mom's knitting basket! Cute as a kitten..:)) Love your drawings. This would make a charming children's book story (and illustrations) Laurel...so fun!! i LOVE this! what a sweet drawing. kittys and yarn, its all good! cute. our lives always have a ball of yarn unraveling no? hope computer problems get fixed soon. Wonderfully done! And so charming. awwww, lollie! this is wonnnderful! love the kits, the goofy cat lady! great whimsical line that nicely matches the washy feel! 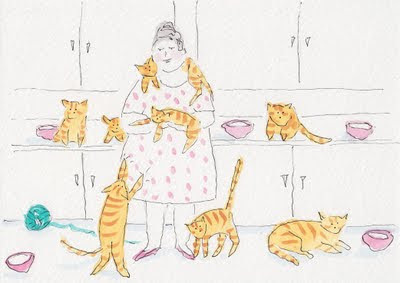 Those kitties look like our Garfield who has moved on to kitty heaven, sweet illo! I think that one off-noted bit of color was absolutely needed. so cute and fun! I love the story. LOL I just realized you must have chosen the pink-colored type to match the pink bowls and polka dots in your illo. Maybe another kind of obsession? If so, it's a charming one. Haha, wonderful take on the topic. That darn yarn! Hehehe! Nice one. I love all the different kitties.Perfect take on the topic this week! Hey I nearly missed this one!!!!!! Oh how cute is this! And all these red tabbies seem so content. She must be in heaven having that furry friend around her neck! Just lovely. All smiles here! I find this image sooo comforting.